Among the many food items that the world got after the Europeans reached America besides potatoes, chillies and maize is chocolate. Today, the chocolate's dark smooth texture, bittersweet flavour and seductive scent is a mass-produced treat. Good chocolate completes the joy of Christmas along with other yuletide musts such as walnuts, marsipan, candles and glittery decorations. And you can't go wrong with an assortment of designer chocolates as a gift. Asia is the new market for chocolate where it is competing with traditional flavours. In Nepal, the market is still immature, and although many bakeries offer delicate chocolates, it is still rare with local chocolatiers. Down a warren of streets near Maligaun is a residence that's probably Nepal's only homemade chocolate factory. 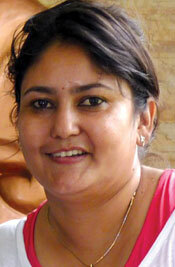 Sristi Joshi Malla (pictured) started Moni's Creations in 2005 to produce handmade stained glass, beads, candles and chocolates. 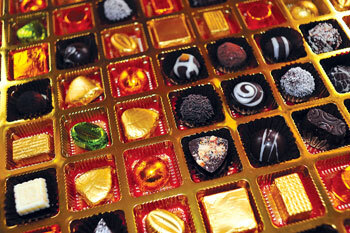 In her display room, Malla urges a visitor to sample a chocolate in bright green foil wrapping from a gift box. The velvety smooth, melt-in-the-mouth, mint praline is one of the specialities at Moni's. The packaging is tastefully done as well, with hand-made cavity boxes of Nepali Lokta paper. "It all started as a hobby, but with time it grew into a business," explains Malla, who sells her world-class chocolate and other handicrafts as corporate gifts during festivals, as wedding and birthday presents and at Christmas time. Moni's Creations has something of a cult following among discerning Kathmandu locals and expats for its uniquely flavoured chocolates in custom-made boxes. A favourite is the silky smooth truffle, and other specialties that Malla created with inspiration from trips abroad, are choclates with almond, mint, butter scotch, cappuccino, crunchy cracker and other tempting fillings.